The Allure Summer Beauty Box for 2013 is coming out tomorrow, Tuesday April 23rd at 12 noon eastern time! It will retail for $39.99 + shipping and handling \ tax all the products together have a retail value of over $250. Keep reading to discover what will be in this year’s Summer Beauty Box! Based on last year’s shipping and handling I'm assuming it will run the same which was $10.00 making the base price for everything $49.99 + tax deepening on your state. I think I'll be sitting this one out but I'm excited to check out the products when other's get them. If you interested in picking this up be sure to get it as soon as it goes live tomorrow (Tuesday April 23rd at 12 Noon est.) because they sell out very quickly and I think this one will go even faster since it's packed full of great products! 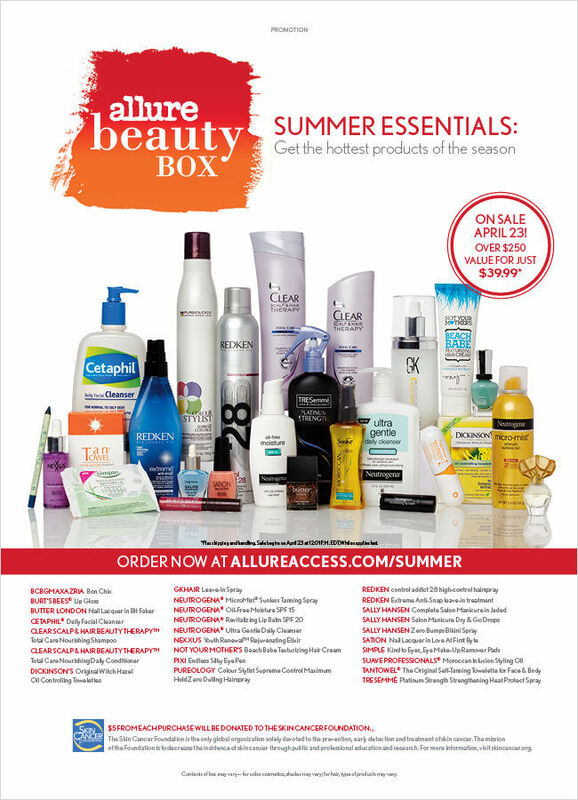 Here is the link to purchase the Allure 2013 Summer Beauty Box this link will not be "live" until it launches! Will you be picking up the Allure 2013 Summer Beauty Box?